Mrs Nicol was born in 1895, and was interviewed on 17 June 1977, when she lived at 11 Rex Mott Court, Witham. She also appears on tapes 16 and 43. The original recording of this interview is held at the Essex Sound and Video Archive. To listen to the recording, please contact them at ero.enquiry@essex.gov.uk or 033301 32500. [???] shows words that are not clear enough to interpret and so have had to be omitted. [?] after a word shows that its interpretation is not certain. In December 1976 in an unrecorded conversation, Mrs Nicol had said she had been interviewed by Jane Dansie for Chelmsford library archives). This tape got tangled after making so the sound is muffled at times. The surviving pieces are merged on side 1 so there is no side 2. In any case the sound is not very good quality. In addition, Q would seem to be furthest from the microphone and the result was that her voice was quieter and it was less easy to distinguish between the two speakers. Also Mrs Nicol spoke rather hesitantly so I have not put in every pause. Quite a bit of background noises – something knocking against machine (? ), a train going past, etc. Q: I remember you told me you came to your aunt’s, was it ? Mrs N: Yes, that’s right, [???] I came …. Q: …. Sorry, is that going to be in your way? …. Mrs N: .… I’m trying to remember, let me think when, the year I came, nineteen [pause] …. nineteen, nineteen ten, nineteen twelve, I came to Witham (Q: Yes) and at that time all the houses, practically all the houses on the left hand of the High Street going towards Chelmsford were all private houses then. And quite aristocratic people lived in them. And of course now they’re all offices or shops, practically everyone. Q: Yes. Can you remember any of the people that lived in them, who they were, and that sort of thing? Mrs N: [Pause] I can see the people in me mind but I just, I can’t remember …. Q: What sort of um, …(Mrs N: They was ….) What sort of jobs did they do then, if you don’t know their names? Mrs N: Solicitors and that sort of thing. There was one gentleman and two sisters, his two sisters, lived together. Two maiden ladies. And, um, Mondy’s shop was practically like it is, well it’s altered previous, just of last year they – alterations [63 Newland Street]. But up to last year that was exactly the same as it was when I came to Witham. And Gilbert’s shop was exactly the same as it was when I came to Witham [83 Newland Street]. The, the, you know, the bakers. And King’s the jewellers, the front of that shop was exactly the same [85 Newland Street]. I think they’ve had interior decorations and alterations but the, the window, exactly the same as it was when I came to Witham. And Witham was really noted for old maids when I came to Witham. There was four Miss Luards lived at Ivy Chimneys along Hatfield Road there. And, um, two Miss Bloods lived in Collingwood Road, and then there was Miss Laurence lived at The Grove House, Miss Pelly lived at Witham Lodge. There was a host of maiden ladies, you know, it was quite noted for …. Q: I see, that was, that was unusual, was it? Mrs N: Well, it was really, I think, the amount of unmarried people here. And dressmakers galore then. There was a Miss Smith just up beyond the Jubilee Oak, the top of Collingwood Road. She employed about twelve girls. My aunt employed five, where I came to. Two doors from me was Miss Mann, she employed about six girls. And, I know there was another, I can’t, on the right hand, on the left hand side going down there was another dressmaker, I just, her name has just slipped my memory. She had quite a big staff. And then, do you remember where the blacksmith’s was then, down at the bottom of the town on the right hand side [probably 130 Newland Street]? Well, there was another dressmaker there. This, employed several girls. You see, you couldn’t buy ready made clothes in those times. Or very seldom. But everybody, you know, had their dresses made. And of course, terrific lot of work in all the dresses to what they are, is now. Q: …. I thought a dressmaker, …. Mrs N: …. Like the big houses had big staff, staff of servants, well, often my aunt would have a, the order to do all the maids’ dresses and make all of the maids dresses, like from Durward’s Hall [Rivenhall], Witham Lodge, Miss Luards’ staff, Blunts Hall staff of servants. We’d make the dressmaker, the er housekeeper’s black silk dress and then the maids’ afternoon dresses, and the maids’ working clothes. They were all made, you know, at the dressmakers in those days. And um, after I took the business over, I made dresses for the Matron at Chelmsford Hospital. I made her several uniform dresses. Q: It was a big job then. Mrs N: Yes, everybody, I mean, the poorest to the richest, all had, had their dresses made, and. …. Q: So if you had it ordered from the big house, it would be the house that ordered it, would it? And then the servants would buy …. Mrs N: Yes, yes, they’d buy the material, probably a housekeeper, you see, would buy the material and then, sort of give the order and then the girls would come and be measured and fitted. Q: I see, you fitted them all as well. (Mrs N: Yes) So the housekeeper would, you wouldn’t have to get the material yourself? (Mrs N: Oh no, no.) They’d buy the material and bring it round. Mrs N: Yes that’s right. Q: Would that happen ? Mrs N: Practically everyone. Till I took, well, just before I took the business over, my aunt started having patterns from a firm in London, well, from two firms in London, used to send blocks of patterns for material for coating and dress material and so, um, when we got known, we often used to supply it, you know. But customers used to have a block of patterns and choose what they wanted. Q: I see and you’d send for it? Mrs N: And then we’d send for it and of course, make a nice little profit (Mrs N laughs). On the, on the bale. Um, we were allowed[?] to make five shillings a yard on coating. On each yard of coating. And of course, er, we used to, for our dressmaking, used to send for a whole piece of lining from the manufacturers, you see, buy the coat lining and dress lining and canvas for the coats, the whole piece, you know. Thirty six yards or forty yards in a piece. And same with lace. The traveller would come with lace and we’d buy, you know, thirty-six yards at a time of different laces and trimmings and that. I’ve got some now, you know, small pieces and hooks and eyes and all that sort of thing, I used to buy in bulk. Q: Was there anywhere in Witham you could buy that sort of thing? Mrs N: No, we used to buy all our small stuff from Spurge’s, when Spurge’s, ‘cos that was a lovely shop for haberdashery and all that sort of thing [42 and/or 76 Newland Street]. And we used to have an account there, you know, quarterly account, and er, you know, we’d send the apprentice out with a piece of stuff and get two reels of Sylko to match that, you see and a yard, two yards of sateen to match and that sort of thing, you see? And, er, we paid quarterly for that, and of course, got discount on that. Q: Spurge’s was a big shop was it? Mrs N: Oh yes, it was a big shop, there. And the girls that, the girls lived in there. There was quite a big, a big staff, so that there was sort of attics over the shop. Well, there was one floor, you know, where Mr and Mrs Spurge lived. And then over the top were sort of attics and the, the staff lived in up there. In the attics. There was a huge dining hall at the back of the shop where the girls had their meals. (Q: Really?) And there was a big carpet room at the, up, went up a flight of stairs to a big carpet room. A Mr Lambert was in charge of that and he lived in one of the houses just past where the Whitehall is, you know, used to be the old cinema [Whitehall is 18 Newland Street]. The first house past there, he lived. But eventually he hung himself in the carpet room. (Q: Really?) (Mrs N laughs) Yes, at that time. Q: Because, I suppose carpets weren’t such a common item then. Mrs N: No, there wasn’t the carpet shops about you see. Um, well, of course people couldn’t afford carpets, really. I mean, nearly everybody had lino, in those days. And it was very seldom, it was only the posh people had carpets. Just the working class had lino in every room and a few rugs, you know. They didn’t have …. Q: But in that carpet shop you mentioned, they would have the actual carpets? (Mrs N: Yes, have the carpets, yes) So who would go and buy those, then? Mrs N: That’s right, you’d go and choose which carpets you liked, you see. Q: For instance, did you have any carpets at, in your place? At Guithavon Street? Mrs N: No, we didn’t go in for carpets or anything like that. Only dress, you know, real dressmaking and my aunt used to do fur work. She was very good at that, she’d renovate fur coats and all that sort of thing. I, but I wouldn’t take that up. It was too, big, and terribly hard work. And a lot of patience, because if you mend a fur coat and put patches in where the fur’s worn, you’ve got to make the fur match; keep all the fur going the same way, you know. It’s a, oh, it’s a tedious job. But my aunt had a terrific lot of patience. Q: Did a lot of people have, what sort of people had the fur? Q: So how did the, what was your aunt’s name? Mrs N: Cooper. Mrs Cooper. (Q: Mrs Cooper). Yes. When she first married, she married a widower and, um, see in my aunt’s youngest days, when we lived at Sandon, and lived at the little shop there, we used to have, well, they did, I should say, not we, they had a cow, cow and um, pigs and that. I told you before. And killed their own pigs and had pork and cured their own hams and all that sort of thing when they …. Well, when my aunt married this Mr Cooper, she persuaded him to open a shop in the High Street. And that’d be where [long pause] where Woolworths is now, I think [35 Newland Street]. She opened a pork shop there and it was a beaut – you know, she took pride, everything you could think of, all home made stuff. Sausage rolls, and pork pies, brawn, home cured bacon. She did a tremendous trade. Her and her husband and there was one stepson, he helped and had a little pony and trap, a cart, not a trap exactly. And he used to go round the country, round to Terling and different places like that. And deliver and take orders, you know, for the, the meat and stuff. But my uncle died in nineteen hundred and four, so she couldn’t carry on alone, so she sold the business and she came to live with us at Sandon, at the farm. She lived with us for about a year and then she felt she wanted to make her own life so she came to Witham and that house was to let, number, not number eleven, the next one, ‘cos there’s six rooms in the next one, she took that over, and she had cards printed and took round or had delivered, the houses. ‘Mrs Cooper, dressmaker, alterations a speciality.’ She thought if she put that ‘alterations a speciality’ that’d start bringing her trade in, which that did. ‘Cos people were only too glad to have things altered to make them more modern or alter the style and that thing, and she worked up ever such a good business from that. That was nine hundred and six, that, when she came. Q: So the butcher’s shop was in, in Chelmsford or in Witham (Mrs N: No! Witham, Witham High Street) Oh was he a Witham, Mr Cooper a Witham ….) (Mrs N: Well, she married a Witham man, you see) He was a Witham man, I see. Mrs N: Yes, he worked in the tan yard [probably Mill Lane] when she, he was one of the head ones at the Peculiars, they used to call them the Peculiars’ Chapel, the Evangelical Chapel there, used to be called the Peculiar People’s Chapel. Well, he was one of the leaders, you know. In the desk as they called it. He was one of the preachers. And she was a very, very strict Christian, you know. Ever so narrow minded and good. (Mrs N laughs). And, and he’d lost his wife and of course I suppose he wanted a housekeeper, so, he asked her to marry him. She was forty at the time when they married. And she persuaded him to give up the tan yard and come and help her, you see, which he did, and, and made a great success of it, till he died in nineteen hundred and four, and er …. [Pause] And then she came back and started her dressmaking business in nineteen hundred and six. Q: Had she done any dressmaking before? Mrs N: Yes, because she’d been with my grandmother, you see, (Q: Of course). Was a dressmaker. That little, um, that photo of my grandson, if you look this side, I think there’s a little photo of, on the next, (Q: Oh, this one,) No, a little group, (Q: Up here?) yes, bring that here. That’s my grandmother, you see. That’s my grandmother, that’s, that’s Mrs Cooper, my aunt. That’s my mother, that’s my other aunt, other sister, and that’s the other one. These were two friends. Well, they were all my grandmother’s assistants. (Q: Good heavens). That was taken outside the back door at Sandon shop where we lived, you see? And look at the work in those dresses, they made them all, you see? (Q: Lovely picture) And, er, when she, after she started that …. she taught herself, dressmaking, my grandmother. She used to do work for Bonds, make all dresses for Bonds where Debenhams is now. Used to make dresses for them to sell in their shop. (Q: That was at Sandon too, was she?) Yes. That was Sandon, um. Q: And what was your grandfather – he was in the shop, involved in the shop was he? (Mrs N: er, well, he…) At home or was he ….? Q: So your grandmother taught herself, but then she taught all her girls …. Mrs N: Taught the girls, you see, and er, and then my, my aunt carried on, you see, and of course, I was apprenticed when I was fourteen, I was apprenticed at Chelmsford. Sixpence a week for two years. And, um, then in nineteen fourteen, of course the war started, the First World War started, and soldiers from everywhere, we had thousands of soldiers about here. And everybody, if they’d got an inch of room to spare, they had to have soldiers. [Noises on tape] My aunt had three soldiers (Q: Really?) She turned her basement kitchen into a bedroom for them. Put two double – a double bed and a single bed and they had three, three soldiers billeted, there. And um, well, everybody, every house had soldiers, you know. Q: Was that, or was Witham a special …. place for …. Mrs N: No, there was everywhere the same in Essex. You know, they came here and were here some time, and then they went overseas, you see. Q: Yes, I was going to say, presumably, they stayed here until they were …. Mrs N: They were trained here, you see. (Q: Oh, were they?) And, yes, the Warwickshire Regiment and, er, some of the Black Watch and the Electrical Engineers. Were all stationed about here. And then they went abroad. You know, went to France [Train going by in background, making noise on tape] from here, a lot of them. A lot of them went to Ireland to the Curragh, to finish the training. My mother, she lived in a little bungalow down at Landfield[?] farm, she had to have two. There, even right down there. Q: Where did they do the training, in Witham? Mrs N: Oh, I don’t know exactly, tell you the truth. I know, Whitehall, that was their head, the Quartermaster’s stores, then [18 Newland Street]. And the food those soldiers used to bring in. Well, it was absolutely wicked, really. Great hunks of cheese like that, a whole ham at a time, a whole shoulder of lamb they’d bring in, and when they went away, I should think my aunt had twenty four, thirty tins of jam in her cupboard that they’d left. They lived ever so well. ‘Cos they used to go to the Whitehall and draw the rations, you see, I suppose they got in well with the Quartermaster, so he gave them extra rations. Q: So, how did, did they used .…? How did it work? Did your aunt have to cook for them? Mrs N: No, oh no, the, she only washed the sheets, that’s the only thing she did. They looked after themselves. Did their own cooking. Q: Did they cook at the homes or did they ….? Q: Yes, it must have been a big change for Witham. Mrs N: There was no end of these soldiers. Q: And did they, would they have shopped locally as well? Mrs N: Well, well, as regard their own rations, they had to draw their own rations. If they liked to spend money on anything else, of course they could spend their own money. But, they, they lived ever so well. You know, on their own rations, you know, it’s marvellous what that must have cost for food, you know, during that War. I don’t know how they got on in the Second World War, but that, of course, was nineteen fourteen so it lasted till nineteen nineteen. And, the Second World War there was no soldiers billeted anywhere. That was a different sort of war. You know, they didn’t have trenches and all that sort of thing. But there were trenches dug everywhere here. The Recreation ground had trenches dug across it, and, you know. Trenches dug in everywhere. Mrs N: In case of invasion And also I expect to, for the, to teach the soldiers how to dig trenches and that sort of thing. Mrs N: Oh, I shouldn’t be surprised, I mean, we generally get some rain, don’t we? Every day. Mrs N: Yes, the Zeppelins used to come over. More, very seldom in the daytime but at night, the Zeppelins used to get as far as London and drop bombs. And on the twenty-first September, nineteen sixteen, there’s a, two, it was on the Saturday evening about ten o’clock, two Zeppelins were shot down, one at [pause] not a great distance from here, I saw it, when we, I was down at my mother’s, down at Landfield[?] farm, down Maldon Road. And we went out and stood in the back garden and we could see the gun fire. And we saw this Zeppelin shot down. Wigborough, that’s right, Wigborough was the name of the place, it was, this one Zeppelin was shot down. And that fell almost in front of two farm cottages. And the next day my uncle hired a car[?] and we drove over and saw the remains. It was just a skeleton, absolute skeleton of the Zeppelin left. And there’s a brooch made of a piece of this Zeppelin. But I think my brother, my, one of, I think my son pinched that, ‘cos I lost it. But I think he took it. That was made in the shape of a sword, a little sword, off that frame of Zeppelin. And there was another one, nearer London, shot down the same night. And then there was one, another tragedy, at midday there was a Zeppelin raid on London. And you could see them quite plainly. They were like big cigars floating about in the sky. Q: [???] …. And then of course a lot of Witham people would go to the war, would they? Mrs N: Oh yes, it seemed everybody, everybody seemed to have gone. It was, there didn’t seem to be a man left in Witham, you know, they called them up, at forty and fifty, at the end of the war. You know, the older men to do different jobs to let the, release the younger men. You know there wasn’t a house that, who’d got somebody at the war. My brother went. He was, he went in with the, he was a reporter on the Glamorgan Gazette in Wales at the time, he was twenty-two, he was twenty-one. And of course, he was called up, he went immediately, he was in the RAFC[?] but he was killed when he was twenty-two. But there wasn’t a house, I don’t think but what, um, but somebody either gone, or they’d lost somebody. I don’t think you’d find many houses but what lost somebody in the war. ‘Cos that was such a different war. Um, it wasn’t all these bomb scares like we got in the Second World War. You know, there was no sirens or anything like that. It was altogether different. No air raid shelters of course, you know. Q: Did they used to get home on leave at all? Or were they just gone ? Mrs N: My brother came home once, we only saw him once in khaki. He went back and he’d been back about six weeks when he was, a sniper killed him. He was collecting the wounded and he sat down the edge of the shell-hole. They’d been working night and day, they never had any respite at all. ‘Cos there were so many wounded about, you know. And he sat down on the edge of the shell-hole, ‘cos he was absolutely exhausted and a sniper shot him in the back of the head. And he fell forward unconscious and they took him to the clearing station but then he died the next day. We had a letter from his friend, a doctor friend, wrote to my mother and told her all the details about, about it. And, er, he was, course, where he was buried in the cemetery at La , I don’t know if I’m saying it right, La Beville[?] [Mrs Nicol spells name]. La Beville[?] Cemetery, in France. Q: Did they have any hospitals here, if they were wounded, did they manage to get some of them back if they were wounded? Mrs N: Oh yes, a lot of , yes, train loads of wounded, you’d see go through. If you were up at Witham Station, loaded with wounded …. By 1909, Frederick was in Canada, working in mines (probably gold mines) with a view to family following. Before 1914: Rose and her parents, Robert and Elizabeth, i.e. Mabel’s grandparents, moved to Witham. Grandfather Robert died and grandmother Elizabeth moved to Guithavon Street with Mabel’s aunt Elizabeth (for whom see below) because Mabel’s mother Rose expected to go to Canada (grandmother lived till she was 95). 1914 or soon after, father Frederick came back from Canada because his wife wouldn’t join him there in view of the War. Part of 1914-1918: they ran Co-op at Earls Colne. Stanley: sixteen months older than Mabel (so born 1893 or 1894). Journalist, first with Essex Chronicle, then Glamorgan Gazette. Killed in First World War. Francis: born c.1905. First World War worked at Afford’s stationers and printers at 70 Newland Street, Witham. When first married, had one of the flats over Spurge’s shop (42 Newland Street). She lost touch with him since their father died. Four. First born about 1925. Another before 1932. Another c.1932-34. Last c.1935. They were Betty, David, Malcolm, and Mary. ??? to 1913, Chelmsford ? – ? 1922 (when married) to c.1924, Scotland, 11 miles from Edinburgh. 1924 to 1935, back to Witham, 11 Guithavon Street, with husband and aunt. Electoral register has Elizabeth Cooper (Rw, Ow), Robert MacAlister Nicol (R, O), Mabel Rose Nicol (Rw, Dw) at Guithavon Street. 1935 to c.1970, 92 Highfields Road, rented. 1909 (at 14) to 1913, with Mrs Cant, dressmakers’ in Chelmsford (probably Mrs Frances Cant, 132 New London Road, Chelmsford (from 1912 Kelly’s directory). Apprenticed 2 years and improver one year. 1913, with Mr and Mrs Bryant, Hoddesdon, supposed to be looking after child (for one month). One year approx at Bolingbroke’s, Chelmsford, dressmaker in workroom. 1922, didn’t officially work after marriage but did odd jobs for people and still did in 1977. Lived 11 miles from Edinburgh. She met him on a visit there with one of her assistants to visit the latter’s sister who had married a Scotsman she met in Witham in the First World War. His mother was a midwife and he had two sisters and a brother John. He was a shale miner in Scotland. Two years in Scotland after marriage (1922-1924) and then back to Witham where he got a job at Crittall’s 1 April 1925[? ]and was there 40 years (to c.1965). Except when it closed for 18 months in 1932 during the Slump. Samuel Card’s family still next door. Elizabeth Cooper died. She attended the Peculiars’ chapel and was very strict (MN). Private F S Newman 8753, 9th Field Ambulance, Royal Army Medical Corps. Died 16th September 1916 age 22, He is buried at La Neuville British Cemetery, France. Thank you very much for that, Richard, I didn’t know anything about that, and it’s very good of you to get in touch. I’ll put the information with my “biography” of Mrs Nicol, which I hope eventually to put on WordPress together with something about some of the other people. She was always a pleasure to talk to, with a good memory and wise comments about her life, and a good sense of humour. I’m quite new to WordPress so I haven’t received many comments, and it’s always quite exciting when I do ! I was wondering how you picked up that there was an interview with Mrs Nicol – it would be helpful to know. I quite literally stumbled over the article by Googling Frederick Stanley Newman and a few links later I found your story. Now your work has given me the chance to go to the record office and hear my aunts voice for the first time. My father was 50 when I was born I was 27 when he died. He frequently recalled his life as a child and life in Sandon and I remember well the stories about his older brother being killed in France but not once did he ever mention the fact he had a sister! I only discovered that she had ever existed sometime in the early 2000’s having looked up the 1901 Census. My fathers family and brother were listed as I had expected but the 5 year old sister Rose Mabel was quite a surprise. Given that I am the only surviving Newman with nobody else to ask, I concluded that there must have been an infant death (of Mabel) either before my fathers birth in 1906 or before his recall and it was never mentioned thereafter. When the 1911 Census was published I was quite taken aback by the fact there was 15 year old Rose Mabel as a dress maker – and of course my dad as a 5 year old. To add a further twist to the plot, my mother was from Derby and my parents were married in 1954 and our family home was in Derbyshire where I lived and grew up in the belief my only other relations were all on my mothers side of the family. In 1979, I left home to accept a job with a company (E W Downs and Son) based in Suffolk so initially I lived in Sudbury before settling in Bury St Edmunds. What I did not realise is that literally just down the road, I had an aunt and 4 first cousins that I have never met so naturally my question is why I was never told especially as my parents visited me regularly in the early days in Suffolk. I can only conclude there was a fall out of some sort. Without bias, my dad was a very kind and forgiving sort of man and had time for everyone so I am baffled as to why there was a parting of the ways. Reading between the lines on Mabel’s interview, it does give the impression that my father was a bit of a handful (don’t know where he’s got to – lost touch etc) but he served 24 years in the Army reaching the rank of Major and having a rough final 4 and half years as a guest of Hitler. I knew my father was married before he met my mother – the story goes that he was reported killed in action (WW2) and his wife had married an American airman in his absence and I have a half brother (never met him) from that marriage. What I did not know until my mother was on her last lap in 2008 is that there was another Mrs N from about 1946 – 50. My findings suggest that Mrs N (2) was the nurse who helped my father back to health but she was a bit loose with her favours so she was given the heave ho and dad eventually met my mother in 1952. My children are aged 20, 18 and 10 and they hold the rather unique position of being just 2 generations away from “My Relation in the Great War” history projects at school. On each occasion, I have had to put a note into their respective history teachers to put them on the right track. I helped my oldest Eleanor with her project which obviously was based on Stanley and a visit to the National Records Office drew a blank on any unknown (to me) information because it would seem that his records were amongst the many destroyed in the blitz. The one thing I don’t have and would dearly love is a picture of my late uncle. I do have a few pictures of older Newman’s including what must be the picture Mabel mentioned in the interview of my grandfather in Canada with a fur collared coat looking so grand. I also have a letter written by Stanley to my father from France whilst he was serving with the RAMC presumably dated before the start of the Somme battle. I can only assume my dad somehow managed to get hold of them at some point after his return home from WW2. This September 16th sees the 100th anniversary of my uncles death and my plan is to visit his grave on the actual day to pay my respect. If by chance you happen to know anyone on Sandon Parish Council, please don’t let on that I “borrowed” a jam jar full of soil from Sandon village green and I will spread this over Stanley’s grave next month. My next task is to pluck up courage and see if I can make contact with any of Mabel’s children or more likely grandchildren. Someone some where must have a picture of my uncle and getting in touch with them and without doubt thanks to all your past work is my only likely chance. Thank you for your wonderful essay about the family ! I am sure that I have more to say but I thought I’d better write quickly that there are three tapes of Mabel Nicol altogether – 15, 16 and 43. I think 16 is a continuation of 15 but 43 is a new one. I haven’t quite figured out how Google works, but it seems probable that they only record the first entry if there are several. I need to go through and cross-reference them all. Do you have information about her “children”. I think I was in touch with a daughter a while ago, about getting permission to publish the tapes, but I think the details will be at the Record Office now – I could get them..
Mrs N didn’t show me any photos as far as I know. I have a few with various members of the family, especially at a VE day party, and I think in a show. I could scan them for you, but perhaps you had better remind me in a couple of weeks, if that’s OK.
You say the family didn’t keep in touch with each other. It’s probably a red herring, but could it perhaps have had something to do with religion ? I recall that some of them were in the Peculiar People (Evangelicals) and some not. Hello Janet and thank you for your reply. Yes, I have printed the content of all three tapes (Cant absorb reading on a screen) so I think there is a bit of repetition between the 2 interviews which of course were 4 years apart. So far, assuming they are all still with us I have 4 first cousins Betty, David, Malcolm and Mary. I suppose it would be easier to try and track down the boys first of all because the girls presumably married at some point but the brothers will still be Nicol. My first move I think is to go to the record office and listen to the tapes but if you have any pictures that you could scan that would be fantastic. 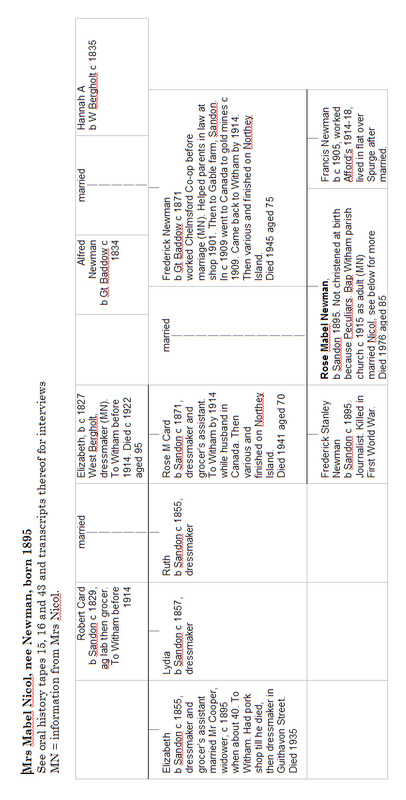 From the transcript, it is clear that Rose (Mabel Nicol) was baptised at the age of 20 in Witham Parish Church (just looked it up – its Anglican – not Wesleyan which was I think(?) the link to the Peculiars) so therefore an adult making her own decision about religion and certainly not by the sound of it a Peculiar. Now that “peculiar” has come to the fore, I remember my father mentioning some relatives – not his immediate family were peculiar but now in the light of things perhaps in the plural. Not being a man to swear I took it that dad meant they were unusual b*****s and being well under 20 at the time and in the certain knowledge they were dead and buried I must have dismissed that snippet as irrelevant. Dad was only religious by virtue of the fact he was a decent human and certainly not a bible thumper so my conclusion is that there was not a fall out over religion between brother and sister. If my grandparents were heavily into Parculiarism (and with it conscientious objection) it didn’t appear to carry forward to the siblings. Stanley was one of the first to volunteer for the War, Rose Mabel made her own decisions and my father – well in the 27 years we shared, I doubt he attended Church more than a handful of times and that would only have been weddings and funerals. As a boy, I was sent to Sunday School (in Derbyshire) because “it was the thing to do” but as soon as my father realised the new Vicar was a hypocrite, I did not have to go again unless I wanted to which I didn’t. He much preferred the previous Cloth who was always on the doorstep of The Red Lion waiting for Opening Time!